On this Singapore's 48th National Day (or Independence Day), let's look at another question from Lorraine Walker's Model Drawing for Challenging Word Problems: Finding Solutions the Singapore Way. The author solved the following grade 4 or 5 age problem, using the bar method. 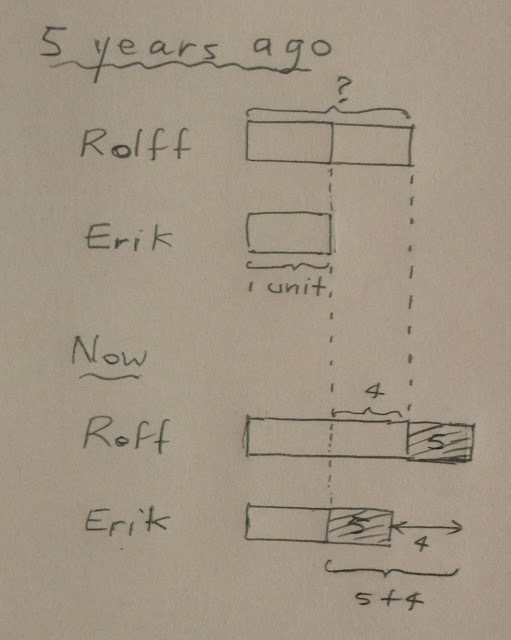 Rolff is now 4 years older than Erik. 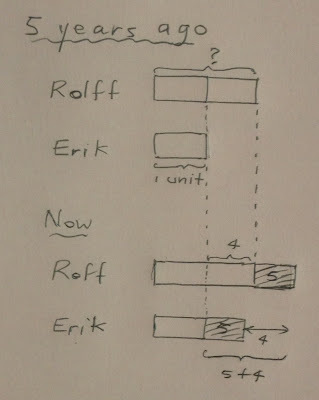 Five years ago Rolff was twice as old as Erik. How old was Rolff 5 years ago? No doubt, the second color makes it easier to visualize what's happening, but what if students aren't given the choice to draw their model in more than one color? In fact, it wouldn't be surprising for critics of the model method to argue that there's no need to "complexify" the solution with all these bars and arrows, when the question could easily be solved without a model drawing. Are there other valid models? In this before-and-after word problem, is there an alternative or better model that may depict the relationship between the ages of the two persons? Let's look at two quick-and-dirty methods of solution, which a number of local students would have used in solving this question. 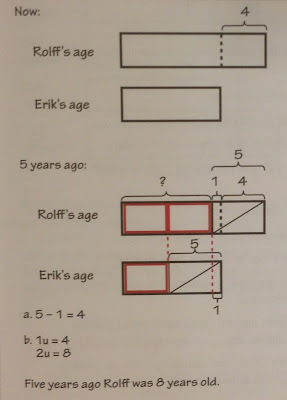 In this method, we assume that we're not aware that the age difference between Rolff and Erik is a constant. Here, we make use of the fact that the distance of "1 unit + 5" is equal to the distance of "5 + 4." Five years ago Rolff was 8 years old. Since the difference between their ages at any point of time is a constant, in the "before" diagram, the difference is 1 unit (2 units – 1 unit), and in the "after" diagram, the difference is 4. So, 1 unit must be equal to 4. The choice of the smaller age numbers and the relatively small number of times one person is older than the other, makes it difficult for one to appreciate the power of the model method in this before-and-after age problem. A modified version of the original question could probably help convince one why the bar method might serve as a useful strategy in revealing the relationship between the ages of the two persons. 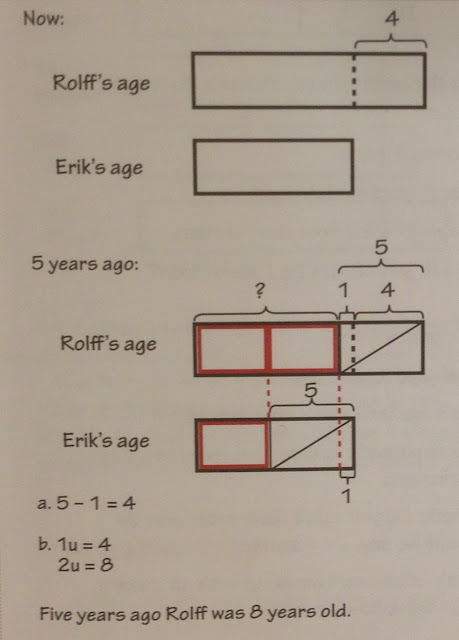 Rolff is now 12 years older than Erik. 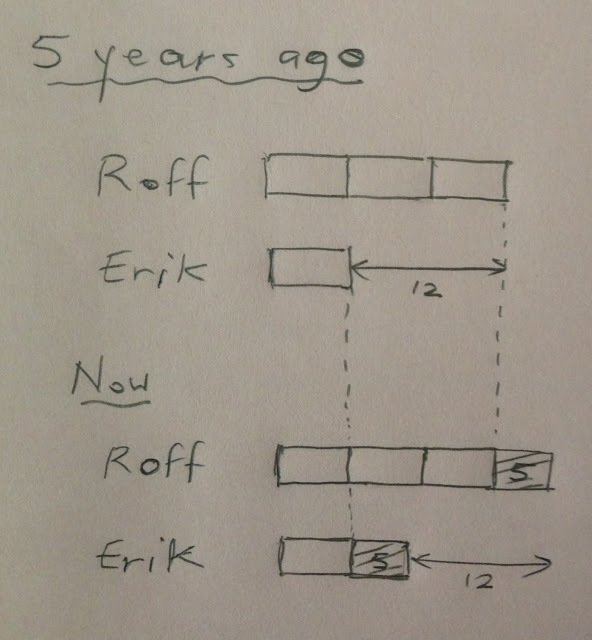 Five years ago Rolff was three times as old as Erik. Five years ago Rolff was 18 years old. This age problem shows that in posing word problems that lend themselves to the bar method, we'd attempt as far as possible to constructing them in such a way that the model method is seen to offer a better problem-solving strategy than other traditional (or formal) methods in solving the questions. Otherwise, there's no incentive for one to wanting to draw a model drawing than use other strategies, which might even be shorter or easier. Walker, L. (2010). Model drawing for challenging word problems: Finding solutions the Singapore way. Peterborough, NH: Crystal Springs Books. © Yan Kow Cheong, August 9, 2013.